Vibrant Meals employee Allie Schrenker describes the different healthy food options to Rachel Harbarger, left, and Maggie Hart, center, at the business' grand opening on Thursday, May 31, 2018. The meal delivery service opened a storefront location at 601 Cherokee Blvd. in the North Shore. Photo by Allison Shirk Collins /Times Free Press. Chattanooga seemed like an unlikely place for Rome, Italy, native Marco Biscarini and his wife, California native Romana Biscarini, to move to to start their healthy meal delivery service. A little more than a year after opening Vibrant Meals, though, the outdoors and fitness- centric community in Chattanooga has proven more than viable for their business — and others — that are trying to grab a portion of the health-conscious locals and tourists in the metro area. In fact, the husband-and-wife team said they have seen 20-25 percent growth each month since they started prepping their ready-to-eat, dairy-free, gluten-free and soy-free meals last year. The couple started with just the two of them and has grown to 18 employees and a new storefront at 601 Cherokee Blvd. in the North Shore where they offer grab-and-go meals for customers who want less of a commitment. Romana, an All-American track athlete, was prepping the meals for athletes and friends back in Orange County, but Marco said he convinced her to move out to Chattanooga after he visited family who had moved here and became involved with the "nurturing," entrepreneurial scene. Marco, who was a college swimmer and water polo player in California training for the Olympics before he injured his shoulder, said the "close-knit community" in Chattanooga is it's secret ingredient. "They are so willing to help, lend you a hand and point you in a certain direction without expecting something in return," Marco said. "In California, they would expect something back. Here, people freely give." Meals range from around $8 to $12 depending on the ingredients, which are all locally sourced from farmers within 200 miles of Chattanooga, Marco said. Vibrant Meals' storefront options include several items, like angus beef stir fry, eggroll in a bowl, spaghetti squash meatballs, french toast and banana chocolate chip muffins. For delivery, meals are delivered every Monday and Wednesday and drivers will deliver as far out as Cleveland, Tenn.
At the Vibrant Meals storefront grand opening, North Shore residents Maggie Hart, 29, and Rachel Harbarger, 27, scanned over the different meal options in the refrigerator in front of them. Both nurses, Hart said she could see herself eating the meals after a long shift. "When we get off, it's helpful to already have something prepared," she said. Marco said their goal is to make healthy eating as convenient and affordable as possible for people like Hart and Harbarger. He said they are widely used throughout the CrossFit community in Chattanooga but are hoping to also become more involved with the Ironman competitions in town. "The challenge in the beginning was the educational component," Marco said. "On the West Coast, it's a saturated market with so many health and lifestyle businesses and weird concepts and diets. In the Southeast in general, there's not as much." Chattanooga is starting to gain more healthy, grab-and-go meal options, though. In Marco's opinion, Chattanooga now offers more in the way of ready-to-eat healthy meals than some bigger cities, like nearby Nashville and Knoxville. There's Fresh n' Lean, Meal Prep Chattanooga and Fit Plus Meals for other options in the area, and Knoxville-based Naked Foods is opening in the first floor of the Edney Innovation Center later this summer. NourishPoint also has two locations in Chattanooga, on Hanover and South Broad streets, for grab-and-go options. 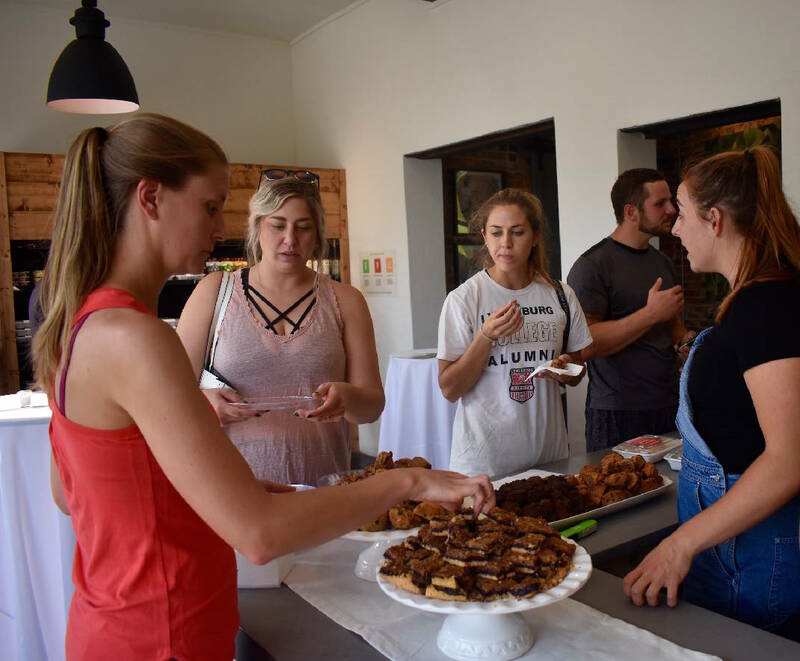 Naked Foods owner and founder Alison Oakes said she chose Chattanooga to anchor the company's first, all-in-one cafe and grab-and-go storefront because she felt like the health-minded business would be appreciated and well-received by locals. "Chattanooga has spent the last 20 years building up the downtown and making appropriate plans to get the city revitalized," Oakes said. "The downtown and mentality of a lot of people in Chattanooga is very health-minded and focused on local, which is what we do." Oakes said she is currently looking for employees to operate the 2,200-square-foot space in the Edney building. Anyone interested in interviewing for positions can contact Oakes at nkdfoodschatt@gmail.com. While Naked Foods is focused on delivery in Knoxville, Oakes said she will mostly focus just on the cafe in Chattanooga and delivery offerings are still "to be determined." She said their best-selling, grab-and-go items include a turkey burger with sweet potato chips and guacamole and grass-fed spaghetti squash topped with goat cheese. All menu items are gluten free. Marco said he has noticed several quick, healthy meal services popping up in the area just in the past year. He's not too worried about the competition, though. "With how fast this trend is growing, there is room for all of us now," he said.